using the List Disk command. As you can see in Figure B, the List Disk command has identified my USB flash drive as Disk 5. I can verify that my USB flash drive is indeed Disk 5 by checking the Size column, which lists the size as 3906MB, which is roughly 4GB. 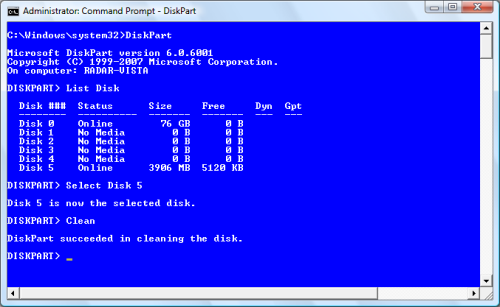 Using the List Disk command displays all the disks in the system. Once you identify the drive number of your USB flash drive, you will need to set the focus of the DiskPart environment on that disk. (This is an extremely important step–Make sure that you select the correct drive or you could accidentally destroy valuable data!) On my example, the USB flash drive is Disk 5, so I will use the command Select Disk 5, as shown in Figure C.
To shift the focus over to the USB flash drive you’ll use the Select Disk command. Now that your USB flash drive has the focus, you need to remove all the partition or volume formatting information from the disk. To do that, you’ll use the Clean command. The Clean operation should occur rather quickly. When it is done, you will see a success message like the one shown in Figure D.
In order to start with a clean slate, you’ll use the Clean command to remove all partition and volume information from the USB flash drive. 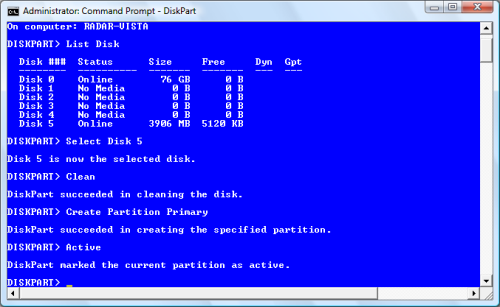 You’ll now use the Create Partition Primary command to create a primary partition on the disk. After you create the partition, you will see a success message and the focus will automatically shift to the new partition. You’ll use the Active command to mark the partition as active, as shown in Figure E. Marking the partition as active will essentially allow the BIOS to recognize that the partition is a valid bootable system partition. 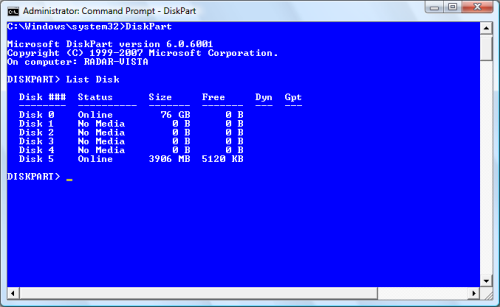 Using the Create Partition Primary and the Active commands, you’ll create a bootable partition on the USB flash drive. With the partition created and active, you’re now ready to quickly format the drive and set up the FAT32 file system using the Format fs=FAT32 quick command. (While you could format the drive as NTFS, the typical way to format a USB flash drive is to use FAT32.) Once the drive is formatted, you’ll use the Assign command, as shown in Figure F, to allow the drive to be assigned a drive letter. 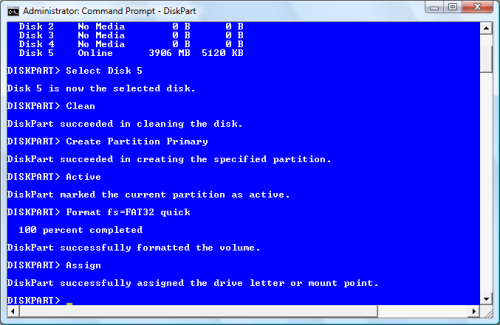 To complete the preparation, you’ll format the drive and assign it a drive letter. The USB flash drive is now ready. 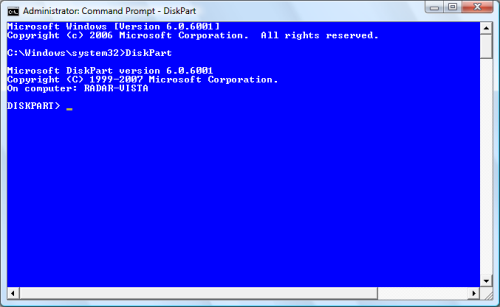 At this point, you can use the Exit command to exit the DiskPart environment and then close the Command Prompt window. Copying the Windows 7 files is easy. 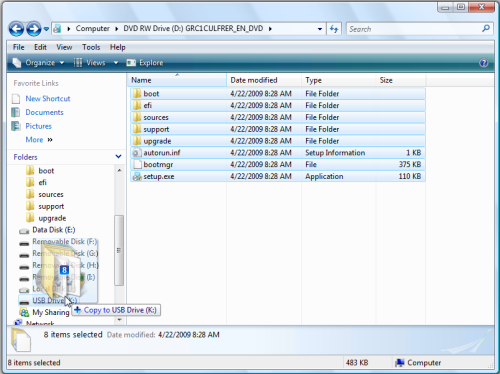 Just open Windows Explorer, access the Windows 7 DVD, select all the files and folders, and then drag and drop them on the USB flash drive icon, as shown in Figure G. Keep in mind that the copy operation will take a little while to complete. Once the USB flash drive is ready to go, you can copy all the files and folders from the Windows 7 DVD to the newly prepared bootable drive. With the contents of the Windows 7 DVD on a bootable USB flash drive, installing the operating system is a snap. Just boot the system from the USB drive and the installation procedure will begin as it normally would, as shown in Figure H. However, the installation procedure will actually run quicker off a USB flash drive since it doesn’t contain any physically moving components. 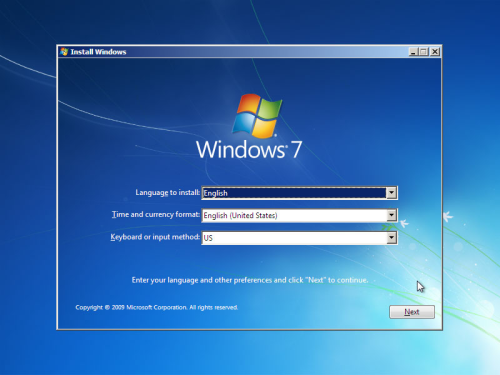 Once the system boots from the USB flash drive, the Windows 7 installation will begin as normal, but it will actually run faster. Hope you all like the content. If you have any questions you can ask in the below comment section.